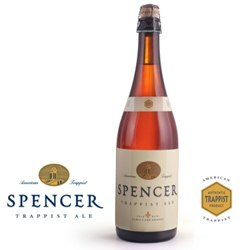 Spencer Trappist Ale is America's first Trappist beer, inspired by the traditional refectory ales known as patersbier ("fathers' beer" in Flemish) in Belgium. These sessionable beers are brewed by the monks for their dinner table and are typically available only at the monastery. Spencer is a full-bodied, golden-hued ale with fruity accents, a dry finish and light hop bitterness. The beer is unfiltered and unpasteurized, preserving live yeast that naturally carbonates the beer in the bottle and keg and contributes to the beer's flavor and aroma. 25.4 oz. corked bottle. Dec 6, 2017 | By Octavian I. Crisp (maybe a bit too crisp). Highly flavorful. The flavor itself is incredibly pleasant and complex. Fruity. Oct 29, 2016 | By William C.
I wasn't sure what to expect since I'm not usually a fan of Belgian beers and I had only heard of Spencer online. My wife and I were both pleasantly surprised at how elegant the beer was. Oct 22, 2016 | By Nate I. The American Trappist Beer could be the best beer in America. Do yourself a favor and order the larger bottle. When poured, the beer is cloudy and a foamy head forms rather quickly - so pour slow! The clean and crisp flavor hits your palate and you recognize the beer as American as Apple Pie. You will not go wrong getting a Spencer's Trappist beer.